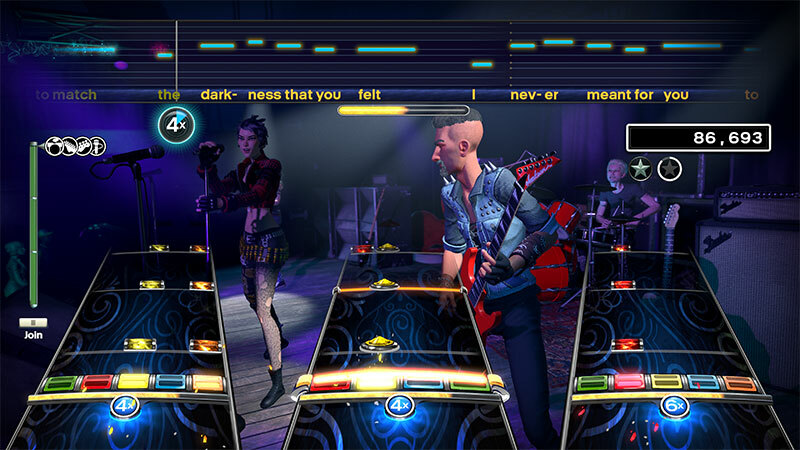 Rock Band Rivals | Harmonix Music Systems, Inc.
the best party game on the planet. 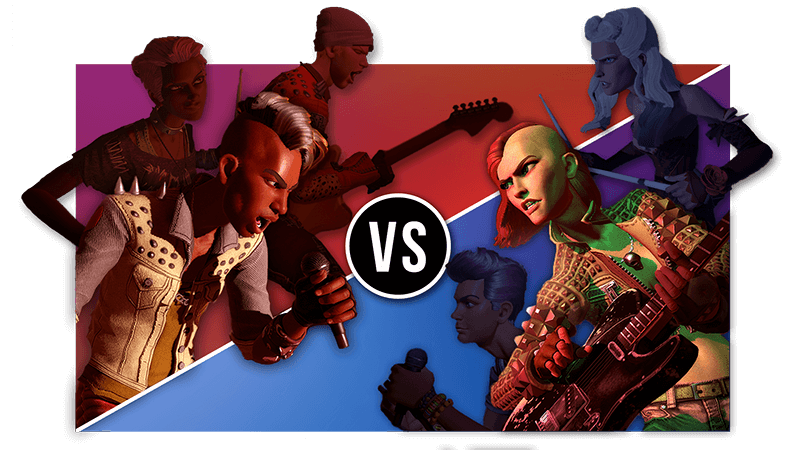 Whether your party is online or in your living room, Rock Band Rivals has you covered. Play with friends in Online Quickplay, or make new ones with our online session browser. 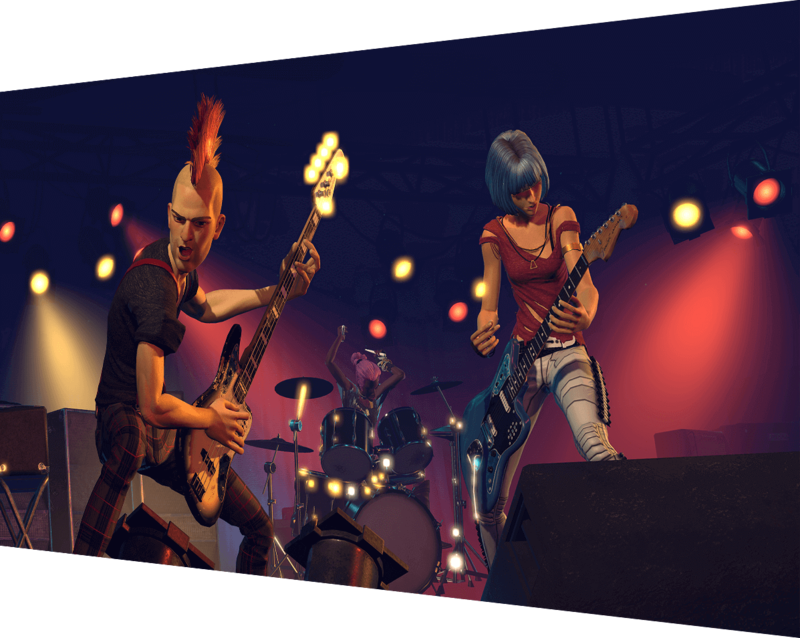 Join a Crew to compete in weekly online challenges in Rivals mode, perform your way through a rock documentary about your band in Rockudrama, plus get more than 50 free songs, new rock shop items, and access to future updates. 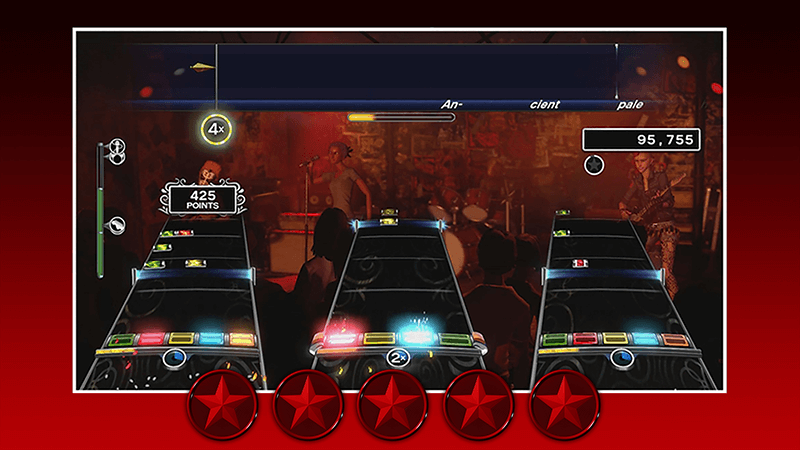 The better you play, the more notes disappear and the harder it gets! 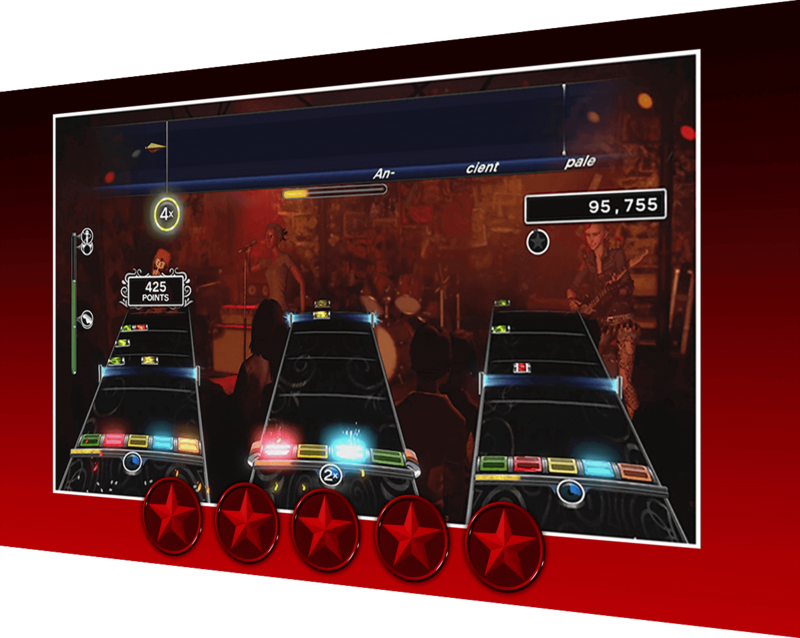 Challenge yourself to get 5 Crimsons Stars in Brutal Mode. 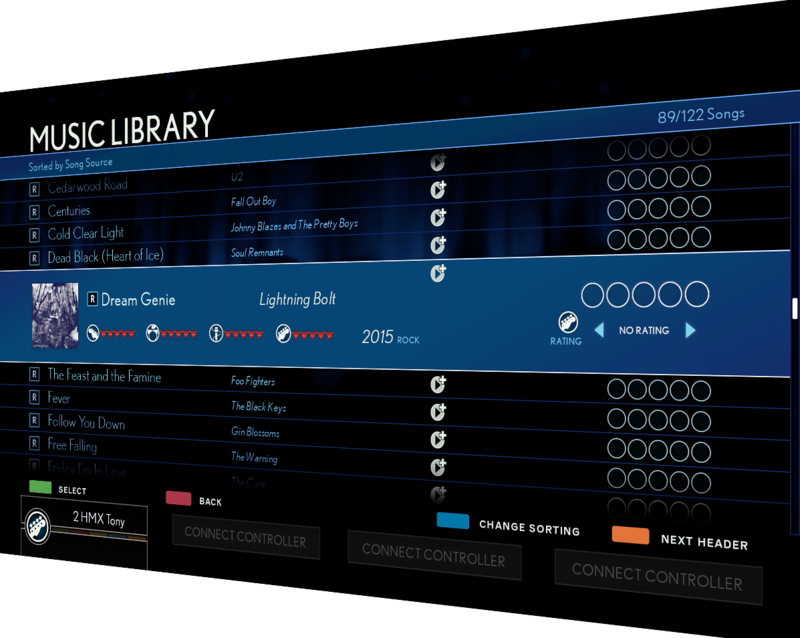 Rock Band Rivals comes with more than 120 songs ready to play. 65 from the core soundtrack and an additional 57 that we’ve added for free since launch – with more to come! 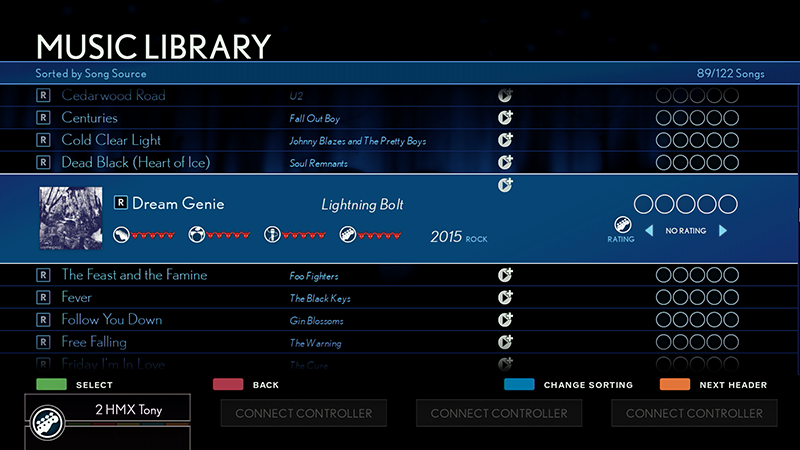 Rock Band Rivals is compatible with loads of existing Guitar and Drum Controllers. Check to see if yours are compatible here. 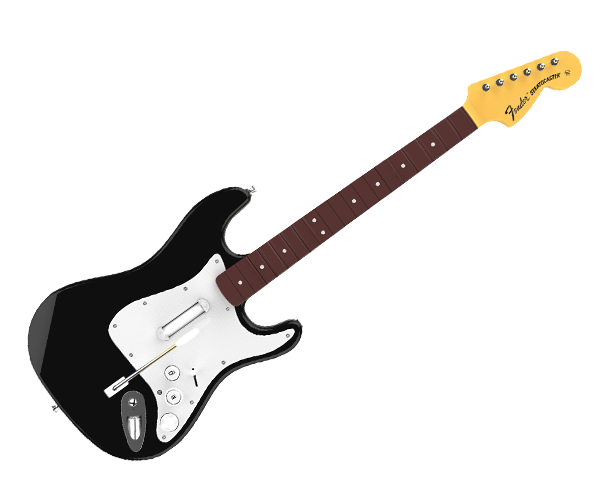 Already have an instrument? Let’s get rocking! 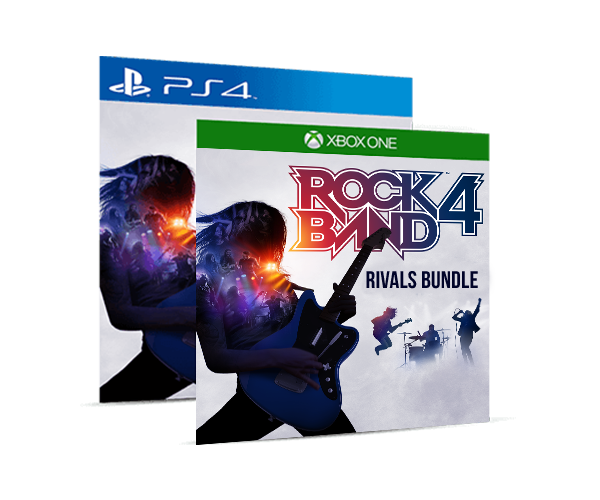 The Rock Band Rivals digital bundle is available for download on both Xbox One and PlayStation® 4. 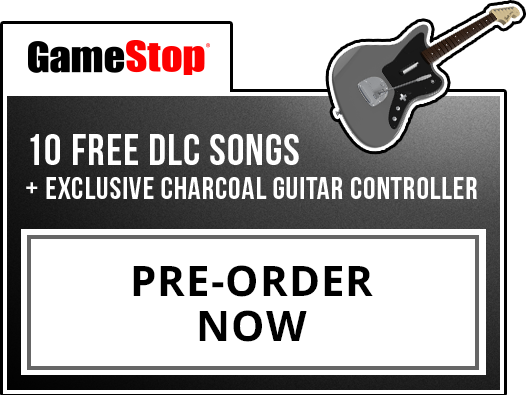 Get shredding with this wireless Rock Band 4 guitar controller – compatible with Rivals! Software sold separately. Lead the band and grab a mic. 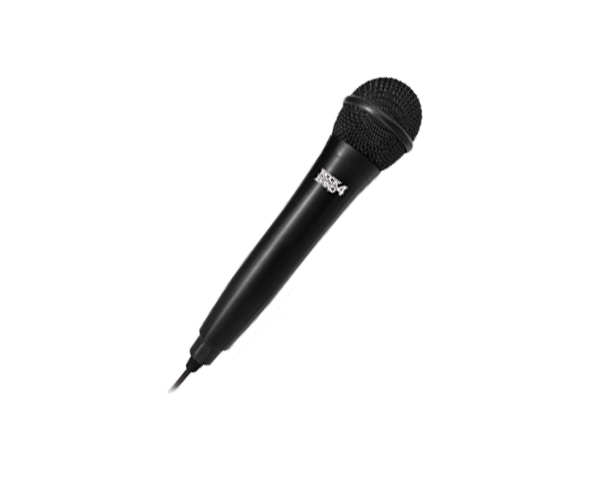 Most USB mics are compatible with Rock Band Rivals, here’s one of our favorites. While bundles are no longer being manufactured, you may still be able to find them at your local retailer, so take a look! 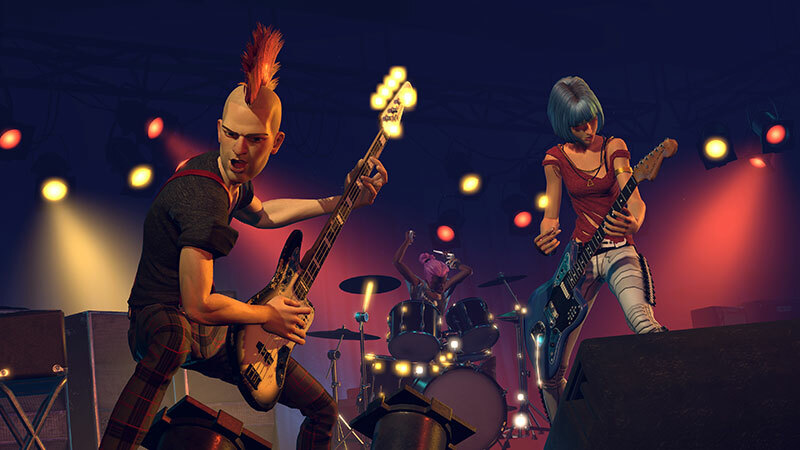 You can also find great deals on lightly used Rock Band Rivals compatible hardware on sites like Craigslist and Facebook Marketplace – their loss is your gain! It’s a Rivals Hub in your pocket! 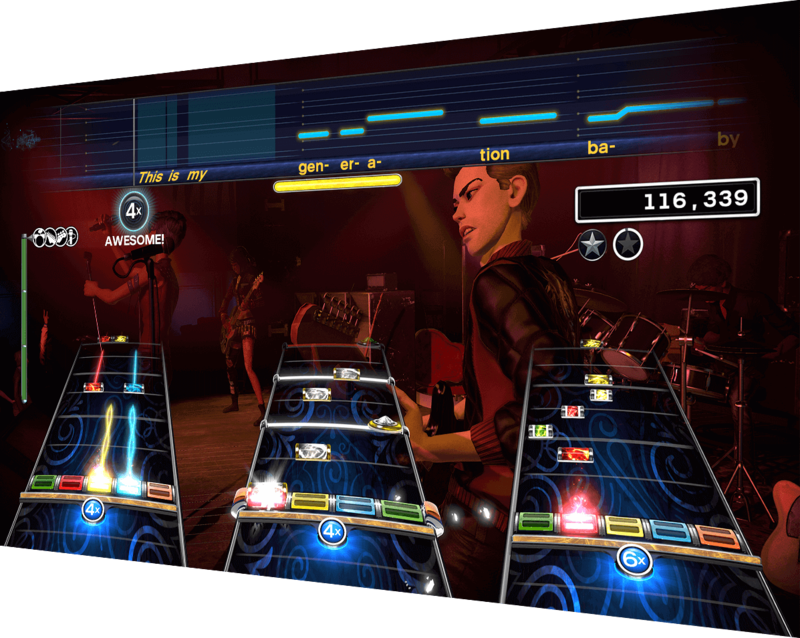 With the official Rock Band™ Companion App, you can stay one beat ahead of the competition. Manage your Song List! Join or create a Crew! Encourage (or taunt) your friends! 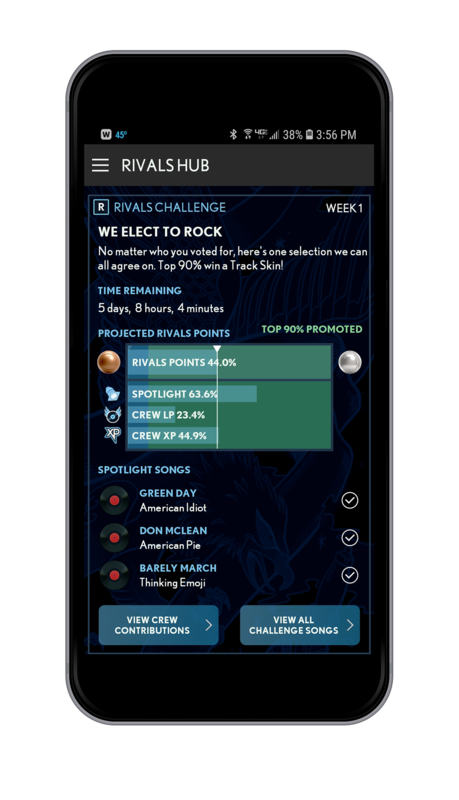 Check your Crew’s ranking! 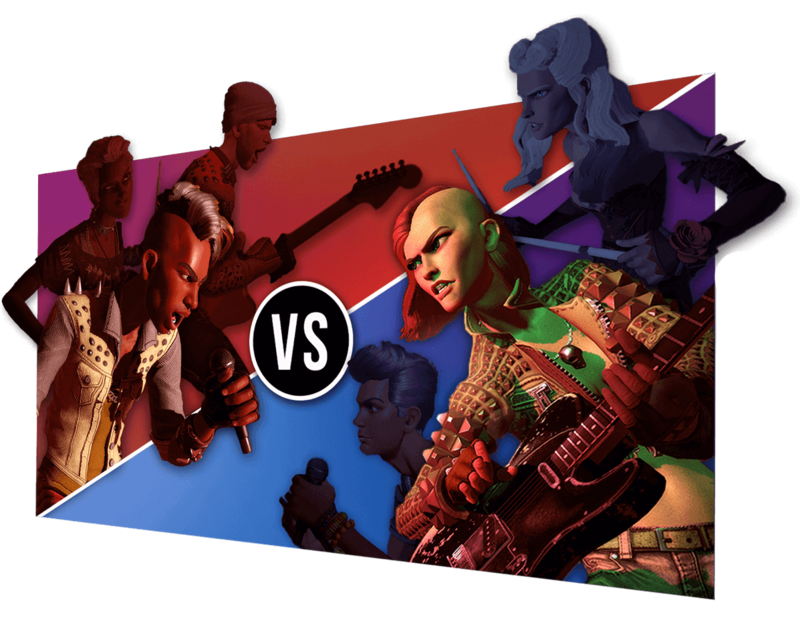 All you need to stay plugged into this epic online battle of the bands, without having to boot up your console. 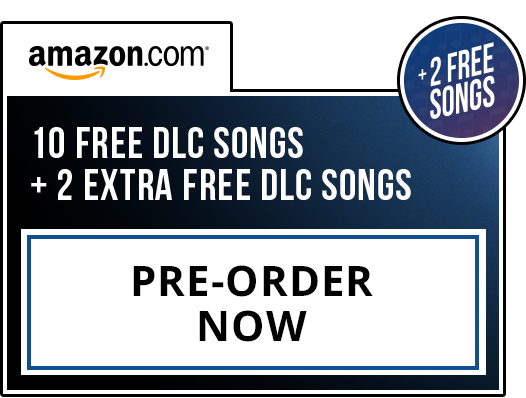 Keep the party going with 65 songs on disc and over 2000 songs available for download. 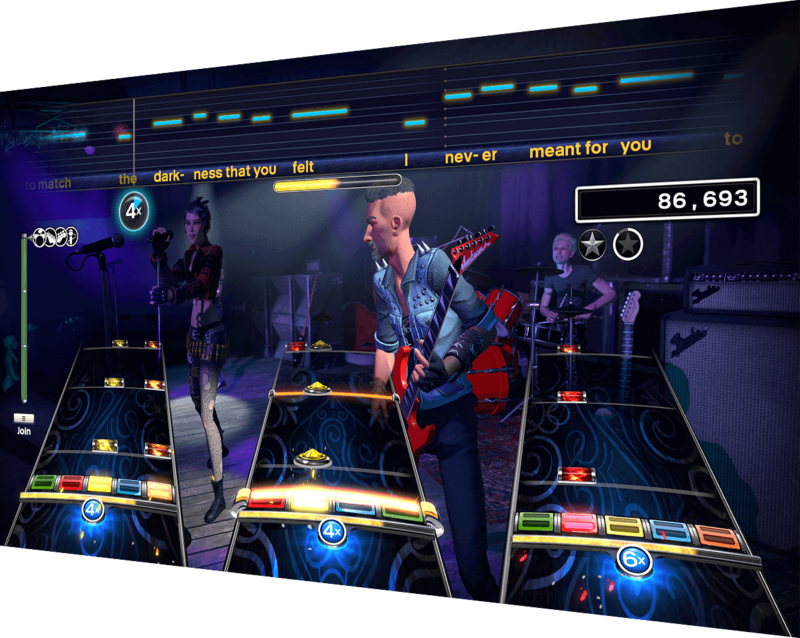 Publisher: Harmonix Music Systems, Inc.
©2015 - 2018 Harmonix Music Systems, Inc. All rights reserved. 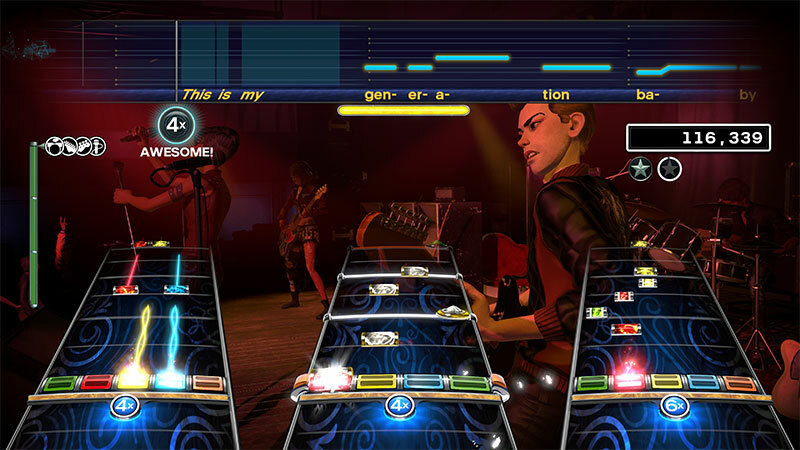 Harmonix, Rock Band and all related titles and logos are trademarks of Harmonix Music Systems, Inc. Rock Band 4 developed by Harmonix Music Systems, Inc. Fender™ and Jaguar™ are the trademarks of Fender Musical Instruments Corporation. Microsoft and Xbox One are trademarks of Microsoft Corporation in the United States and/or other countries. “PlayStation” is a registered trademark of Sony Computer Entertainment Inc. All other marks are the property of their respective owners. This product is covered by patents identified at www.harmonixmusic.com/patents. Amazon and the Amazon logo are trademarks of Amazon.com, Inc. or its affiliates. We are a participant in the Amazon Services LLC Associates Program, an affiliate advertising program designed to provide a means for us to earn fees by linking to Amazon.com and affiliated sites.